CALLIE SCHOTT - PROFESSIONAL RIDER/TRAINER now trains and rides for the Ingram family in Franklin, Tn. Her roots started at River Mountain Farm owned by parents Trey Schott, DVM and Elaine Schott, Trainer, where she has horses in partnership. Upon graduation from the University of Kentucky, Callie spent nearly 5 years as the assistant rider for Beezie Madden at John Madden Stables, Inc. During her time at JMS, Callie sharpened her riding and horsemanship skills and learned various training methods that have made John and Beezie Madden one of the most successful rider/trainer combinations in the world. Callie has established herself as a rising star in the sport of show jumping, as well as revisiting success in the hunter ring. Most recently Callie has developed several young talented prospects into successful Grand Prix horses, has won the 7YJC on the talented Verona. She campaigned at some of the best shows in North America earning top honors in prestigious competitions at Spruce Meadows, The American Gold Cup, The New Albany Invitational Classic, Winter Equestrian Festival, The Vermont Summer Festival, The Hampton Classic and the Kentucky Horse Shows series. In addition to competing she was responsible for training several young riders at various levels from Ch/Ad jumpers to Grand Prix during her years with the Maddens. Callie co- hosted a unique national contest with John and Beezie, that was searching for talented American homebred jumpers. She chose 3 finalists from the 50+ applicants to receive free training and showing for three months. The Chronicle of the Horse followed the progress via their online blogs and it was a huge success for promoting American made young horses. 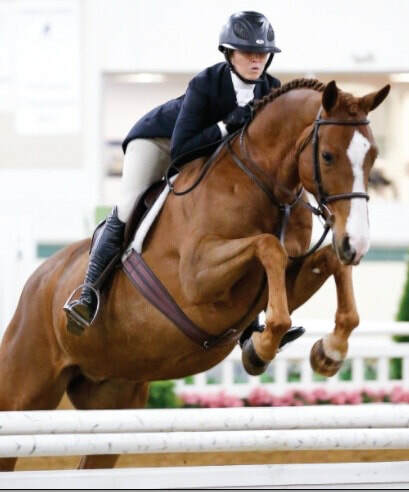 During her first year back in the Mid West, Callie has garnered attention with her string of talented young jumpers, and upcoming Grand Prix horses. Her students and clients speak to her integrity, pleasant people skills, strong work ethic, and being the ultimate professional 24/7. Her passion for the horse exceeds her unrelenting drive, which makes for a great combination of qualities. Callie is now employed by Orrin and Lee Ann Ingram in Franklin, TN. where she is the Trainer/Rider. She splits her show schedule in KY,TN, and Wellington. You may email Callie at callie.schott@gmail.com. ELAINE SCHOTT-TRAINER/OWNER received her M.S. from the University of Kentucky which accompanies 37 years of professional experience. After graduating from UK with her B.A. Elaine became a riding instructor at the Margaret Hall School while completing her graduate studies. Upon completion of her graduate studies she worked at Masterson Station Park as the Park Director for 12 years. She was responsible for the care of horses and riders, put on horse shows, clinics, horse trials and lecture series. During this time she became a Master Instructor of therapeutic horseback riding. She was a professor of Equine Studies at Midway College for 5 years and Coach of their Intercollegiate Hunt Seat Team. In 1992, she began to coach the University of Kentucky IHSA team. She currently trains students at her River Mountain Farm. She has turned out very successful riders who have won National Championships. Her daughter Callie Schott, won the Children's NAL finals on Miscongeniality in 2001. She was 2002 Junior Hunter Finals Champion on Almost Famous. Callie was a very competitive junior rider in the hunter, jumpers and equitation divisions. Amber Seigelman was the National Champion at the 2006 Pony Jumper Finals and a member of the Bronze Medal Team in 2005 riding The Waterboy. Tara Bramblett was the National Champion in Atlanta in the IHSA Intermediate Over Fences in 1999 and Lindsay Kendall was the National Reserve Champion at Cazenovia, NY in 2000. Callie Schott and Ali Cibon were both National Champions in 2009 as well as winning the prestigious Team Hunt Seat National Championship. Elaine has been serving on the KHJA Board of Directors for 10 years. She is Vice Chairman of the USHJA Youth Committee and implementer of the USHJA Quiz Challenge Program. She has served on the Zone 5 Board of Directors since 2002. She is currently serving on the USHJA Zone 5 Jumper Committee. 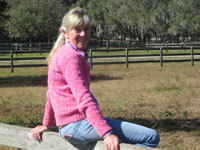 Elaine is a Certified Trainer with USHJA. TREY SCHOTT DVM-OWNER is an '81 graduate of The Ohio State University Veterinary College, an accomplished horseman, equine veterinarian, and polo player. 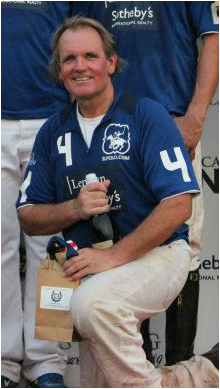 He played polo professionally throughout the United States at a 5 goal rating. Trey is a local businessman, entrepreneur, and Ace Hardware affiliate. He oversees the health, nutrition and medical care of all horses at River Mountain Farm. Trey specializes in reproduction, farrier science, sport horses and lameness. Trey has retrained countless OTTB over the past 30 plus years for polo, eventing, and the hunter/jumper world. Trey and son, Buck, a professional polo player, operate the polo division of RMF playing and training young horses in Kentucky and Florida. Trey and Buck have participated in the TB MakeOver the last four years. 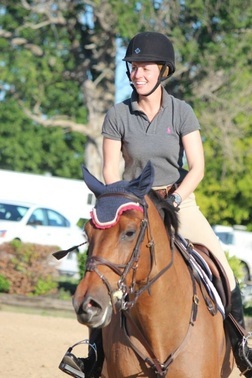 MADDIE PILZ- ASSISTANT RIDER/TRAINER comes to River Mountain Farm as a recent graduate of Lake Erie College and brings to RMF over 10 years of riding experience. Maddie has a passion for young horse development and prides herself on proper education; she has experience developing young hunters and jumpers, Maddie has a great work ethic and kind demeanor which make her a great teacher and asset to our program. ALLISON DAVIDSON SCHOTT A 2010 University of Kentucky graduate in International Economics, Allison has diverse skills which take her to our Polo operation for the winters and the Hunter Jumper barn for the remainder of the year. Allison helps out with the riding and at horse shows. She and her mare, Isadora, are a force to be reckoned with in the Adult jumpers. Allison is always around to lend a helping hand when and wherever it is needed.